Fleas are a year-round problem in Florida and besides being a nuisance, can cause disease. Contrary to popular belief, fleas cannot fly, but they can jump surprisingly high and far for their size – almost three feet! 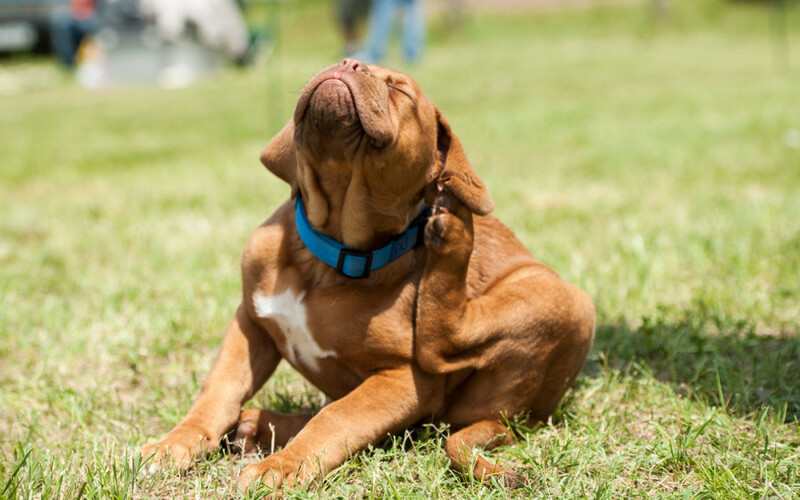 In an animal who’s very sensitive to flea saliva, very few fleas are needed to make a pet extremely itchy. Some fleas are infected with tapeworm larvae. When an animal ingests the infected flea, the tapeworm larvae develop in the intestines of the pet. The adult tapeworms are then vomited or passed in the stools, which may be loose as a result of the parasite. The adult tapeworms can look long and segmented or can be passed in small segments that look like rice. Besides aggressive flea control, animals with tapeworms need to be de-wormed by a veterinarian. Fleas can also pass along to cats a potentially fatal blood parasite called hemobartonellosis. This tiny parasite is injected into the cat through a flea bite. Diagnosis of this disease must be made by looking at a blood smear under a microscope. Some cats and dogs are highly allergic to flea bites. As little as one bite can cause severe discomfort and itching in a flea-allergic pet. Keeping fleas off the pet and initially treating the environment for adults and eggs will help prevent an allergic reaction. Controlling the problem once it has started is much more difficult and costly. The products made available in the last few years have revolutionized flea control in pets. These products are available through your veterinarian. There are choices between topical and oral products. Most products contain multiple preventatives, as well as insect growth regulators to stop the eggs from hatching. These products are applied or administered to your pet once every 30 days for best control. All fleas on the pet will die within 24 hours or less. Any new fleas that jump on the pet will die a few hours after jumping on or biting the pet. Products such as flea collars and shampoos are very toxic and serve only to kill the existing fleas and have no residual effects. Therefore, each time your pet goes outside they risk getting more fleas on them. Using a veterinary approved product prevents a severe infestation in your home as well as keeping your pet flea-free. These products should be used year-round for the best flea control.